Civil and Religious Law in England: Contra Canterbury! 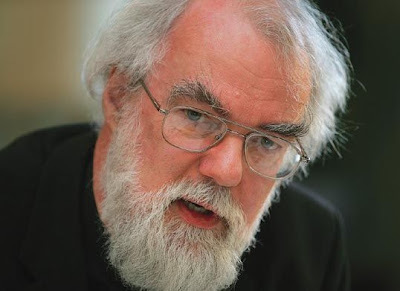 I have heard Rowan Williams speak and unlike some am fairly well disposed to him- he gave a fascinating talk on art and philosophy at Cambridge in 2005. I suppose that makes me a perfect advocate of the argument that today the Archbishop has made a complete idiot of himself. Partly he has made an idiot of himself through the fact that whatever Rowan Williams does understand, the media isn’t one of the things that he gets. Partly though he has made an idiot of himself because he has advocated a concept of law which I think is dangerous and creates a special privilege for established Churches in this country which they should not have. there is a risk of assuming that ‘mainstream’ jurisprudence should routinely and unquestioningly bypass the variety of ways in which actions are as a matter of fact understood by agents in the light of the diverse sorts of communal belonging they are involved in. Williams of course over emphasizes the communal (and Matt Sinclair has criticised the Archbishop adequately on those grounds here): but he also mistakes what the law is about. The law is the instrument by which we maintain peace and mark out civil goods and bads: it delineates that which the country considers private and inoffensive and that which the country considers public and dangerous. The law insofar as it does that cannot respect the will of the particular agents who operate under it, even if they have a sense of ‘communal belonging’ which say excuses murder: the question before lawyers is what did they do and what is the punishment. In some situations the law also arbitrates and here you could argue that the intentions of the agents matter- but that is only in the sense that the law intends to respect both of the agents. The sense of the agents is not what governs the process of arbitration but its a factor in it. For example, say I am someone who believes that animals are equivalent to children: the fact that I believe that is a factor in the decisions the court might make, but it does not govern those decisions. Williams is right that the law should not be blind to the intentions of agents as factors in any decision, but it should not be governed by those intentions (and he knows it shouldn’t- at one key moment he qualifies his own position to exclude the religious courts ever destroying someone’s rights- quite how he would do that when almost all law concerns questions of right is a different and interesting matter). Ultimately the standerd to which the law aspires is not Muslim, Christian or Jewish justice or Mormon or Scientologist justice but its justice as defined by statute and precedent within Parliament- justice as it applies to everyone who is any of those five religions and to anyone who isn’t from the Sikh to the Satanist, from the atheist to the polytheist. The problem with Rowan Williams is in part that he is deceived by his own subtlety- go and read the lecture it is an example of encasing yourself in sentences like a mummy in wallpaper and then trying to walk through a crowded tube platform. But its more than that. As a theologian Williams wants us to think about revelation all the time: but revelation doesn’t have that much to do with politics. In a democratic secular state, revelation is a factor in any decision but it doesn’t govern what the government should or shouldn’t do. Ultimately people who believe owe just as much as people who don’t to the state because the state is not a religious formation- it is on its Western model a secular foundation which exists to perpetuate the well being of its members. The point isn’t that religious people can’t be religious, or can’t be members of society, but that the state isn’t interested in their religion. They can use religious justifications for their political actions if they like- but those justifications will only appeal to those that share the same religion and will irritate those that don’t- they will produce communities struggling against each other. The state is a minimalistic project in the sense that it talks a minimalistic language of politics- the problem with Dr Williams is that for him that just isn’t enough. Its a common problem that you can see here and across the Atlantic- the current Pope is another person guilty of demanding accomodation on his own terms alone. But what people need to realise is that as soon as you create a legally privileged religion or argue that all argument has to take place in religious terms: you do abandon the whole idea of a secular state- a meeting place between people of different religions and none which does not proscribe any faith but tolerates almost all. There is a lot of modern work been done on these questions- Mark Lilla has just published an interesting book I mean to write about here in the future on the philosophy of this area. But ultimately it all comes down to the reasoning of the earliest modern philosopher of secularism, Thomas Hobbes. Hobbes had a dark vision of where arguments like the Archbishop’s could lead us: towards a hell of civil strife and communal violence, towards religious tyranny and massive unhappiness. Despite my admiration for Rowan Williams, who is a very intelligent and thoughtful person, this time I’m with Thomas Hobbes. This French Thriller from last year is a sophisticated effort and it asks some interesting questions- particularly about the nature of love. A man's wife died in a horrific murder eight years before the action of the film, he has barely been able to recover since from the incident, still traumatised he throws himself into his work, until that is he gets an email from her. There she is standing in the entrance to a building in a foreign country- the film then winds itself round the question of her return and what actually happened in to her and to her murderers in a wood long ago in rural France. Our hero is by turns bemused and confused, he seems to have lacked any real sense or purpose to his life and now he finds one in the returned wife that he thought he had lost. The film's denoument is a little trite- too much is brought together- but that's not the purpose of the film, rather its a study of the effect of loneliness and obsession upon the life of one man. There are some fantastic sequences here- especially as the hero runs through the motorway traffic at one point. But its the psychological dimensions that are most interesting. The man, Dr Alexandre Peck, is played wonderfully in particular. One gets in his face the image of an unending loneliness- a solitariness that he cannot relieve in the absense of his life. Its particularly well crafted as early on in the film we see him before his wife's murder, sitting together with friends and enjoying a beer on a perfect summer night. By the time we make his acquaintance again he has become haunted and lonely, withered amidst the storms of life and sent sprawling backwards upon his own solitude. When his wife intones to him the words 'Tell No One' on the video she sends him, its an instruction he is almost perfectly capable of fulfilling- there is noone almost that he can tell. That almost is there as a qualifier becuase he does have two friends. A Lesbian friend of his wife and himself who becomes his confidante. Her relationship too is threatened by the whole unfolding drama and she too is a victim in her own way eventually of the events in the wood. His other friend is a wonderfully played Parisian thug- who assists him in escaping from the police and in avoiding capture. You see by this time the police themselves are beggining to suspect whether Alexandre had anything himself to do with his wife's death or the deaths of others- the corpses do begin to mount up in this drama in the true style of a Hitchcock thriller. What is interesting therefore is the way that the loss of his wife has rendered this man a deeply sad but brilliant man- it drained him of his core and placed him in the position of maintaining a facade of a successful doctor whilst actually being vacant inside. This is a really interesting thriller- its well worth seeing- its exciting and clever in equal measure and should delight anyone who likes cinema on any level. I apologise for not doing this yesterday- other things drove it out of my mind! Anyway here we are today with a more limited and yet still illustrious list of posts from the UK blogosphere. We cover a whole range of experience here from the 17th to the 20th Century. Anyway to kick off how about reading James Hamilton's views on Capello's managment style- interesting and thoughtful as ever. Capello may be adopting a distant style to his players, but as Dave Cole points out the Tories are adopting a much more nannying style to the country. Freemania suspects though that the Tories themselves may need some nannying: is Cameron really only just about as good as Kinnock? Who cares anyway? From the desk of George Galloway we have the greatest attack on Imperialist scum ever delivered- may they die in their own individual Trotskyite, Zinovievist, Bukharanist, revisionist running dog hells! But if they don't it doesn't matter, as they'll start blogging and end up in a legal fight: Mr Eugenides seeks to adjudicate in the latest battle betwixt Tim Ireland and Guido Fawkes. Calm down lads, the real idiocy is about the issues (as I said yesterday), Matt Sinclair's got a bee in his bonnet about the latest paper from the Social Market foundation on climate change- he isn't too impressed. Incidentally happy birthday Matt- for a two year old you are quite articulate. Don Paskini is another articulate lad concerned with issues, this week its sharing the proceeds of growth and how the Tories don't even understand their own policies! And that's good as it means that you don't have to attend SOAS, where the Iranians are putting on conferences funded with our public money- go to Harry's Place and see what you can do about it. Or rather don't, because society is going to pot anyway and its all religion's fault: we've been having the argument over at Liberal Conspiracy, go and start with Kate Belgravia's provocative and well written post on why Jesus Christ should dominate our politics less. Thing is that Kate should calm down, afterall look at what all those Muslims gave us in the Middle Ages: modern science and all- not convinced- well time to bring on the historians! And here they come, leaping like a herd of wilderbeast through some savannah forest. First up is that classic civil war debate between Pepper and Puddle the two dogs- canine confusion becomes a metaphor for other debates. On a more illustrious subject, the Early Modern Whale circles around the Old Cheapside Cross and finds out what he can about its history. Some of us though are only too depressed by the present, its hard to avoid when you here that the bulbs are coming up even earlier than usual in Kew Gardens. But not everything is depressing- and ending on a high note- just consider the Political Umpire's tale of these two human beings whose bodies are joined together. So long till next time I host the carnival- sorry for a short one- but I hope there is something there to savour! You read the title right: here is Robert Fisk's review of his own biography of Saddam Hussein. Well not quite his own. Though Fisk has a biography of Saddam Hussein published in Egypt, it isn't actually by him, its a forgery, published by an enterprising journalist who had heard of Fisk's leftwing reputation and thought he should have written a biography of Saddam Hussein. Fisk's article is hilarious as he traces this man across Cairio but it brings up for me something even more interesting which is this. We often presume on the internet that we have our identities set in stone and the real danger is that people will snoop on what we write from afar and find out that we are secret conservatives or something. I think that's the wrong danger- though it exists- I wonder whether one of the more interesting internet problems over the next couple of years as blogging matures will be identity theft. Tim Ireland has drawn attention to the problem of sock puppetting on the internet- but I think there are more egregious things to come. Take Iain Dale, the reason I advance Iain is because of his electoral ambitions, it would be perfectly possible for someone to fake an identity as Iain Dale on the internet and start commenting on various blogs in his guise giving electorally embarrassing posts- the same goes for any politician blogging from Paul Flynn and Harry Barnes to Nadine Dorries and John Redwood. Trademark theft on the internet is an interesting issue: I'll be fascinated to see how it develops- especially given what Fisk rightly says about the difficulties of enforcing trademarks in various countries. I know its a hackneyed subject- but Guido posted his own manifesto for the reasons for his blogging and I thought I'd reply and I have here.